Heart Tanks increase X's maximum health by 2. There is one tank in each maverick level; thus the maximum amount of health X can have in the game is 32 (16 + [8*2]). After beating Flame Mammoth, get to the part with the Ride Armor get in it and ride it to the part where there's a cave you have to go through. At the left entrance you can jump straight up off of the column and then jump out of the Armor and up onto the ledge. Use Fire Wave to destroy the first mosquito bot generator up there and you'll see the Heart Tank laying inside. then hop out of the armor onto the top of the cave. After beating Chill Penguin, follow the level until you run into the pick axe throwers. From there, run across the ice covered floor to the very bottom right. The Heart Tank lies in the corner. If you defeated Boomer Kuwanger, the Boomerang Cutter is also a neat way to get it. It is technically possible to obtain the Heart Tank before defeating Chill Penguin or Boomer Kuwanger, although it will result in death on the lava if not enough Heart Tanks or the Armor Upgrade have been found. After killing the first Mega Tortoise, but before heading down the ladder, climb up the wall and you'll see a Heart Tank sitting there. You'll need to have the Leg Upgrade to get it, so hopefully you've been following this guide! Simply perform a wall dash while you're scaling the wall, then quickly jump on the ledge with the heart tank on it. Climb up and collect your prize. Alternately, you can use Boomerang Cutter instead. Beginner note: for this trick you need to press the dash and the jump simultaneously on the wall to perform a longer jump off the wall. It is very, very important to know this mechanic for getting good at basic play. Right after the second mine cart, you'll come to a large gap. Drop down and start shooting the Mole Borer with Flame Wave until it's finally destroyed, then continue down the path, where you'll see a Heart Tank on a ledge. Jump up on the ledge and take it, dropping back down and continuing down the path. If you haven't gotten Flame Wave, stay far right at the dropping part, then you'll land on the small platform. Carefully slide down the wall and drop in front of the Mole Borer. Run/dash ahead of the Mole Borer to the heart tank. Alternatively, if you are fast enough, you can use the X-Buster to shoot the Mole Borer before it reaches the heart container. Start incinerating it with Flame Wave. Once it's gone, collect the Heart Tank that's on the ledge. After the second Anglerge, proceed forwards and you'll notice two large funnels. Jump into the second one, and when you get to the top, jump onto the green ship that's on the surface. Destroy the blue orb that's on the ship until it finally goes down (some annoying grabber bots will make your life harder, so destroy them if they get near you). The Storm Tornado can destroy blue orb immediately. The ship will then create a passage to an underground area: go in and prepare to fight the third sub-boss, a large snake robot. His only weakspots are his head and tail, so aim for those. He's very easy to dodge, but hits very hard, so try your best to avoid him. To easily dispatch him, use a Storm Tornado, charged or otherwise, and he'll be gone in no time. Once he's dead, go to the right, grab the Heart Tank, and then scale the wall next to the destroyed ship to make it back to the ocean floor. 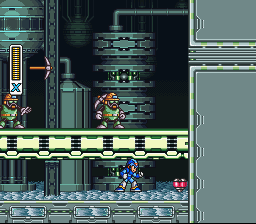 Note: The snake's body segments do not do any damage, so it is possible to stand on him while he's moving. This is the funnel that leads to the ship. Fight the Snake Robot: its weaknesses are its head and tail. The Heart Tank is in plain sight, on a small balcony at the very top of the outside section of the stage. Go into the building, charge up the Shotgun Ice, and release it to create an ice platform. Jump on the platform, and it should go flying out of the building. Jump off the platform onto the balcony to obtain another Heart Tank. Alternatively, if you missed the Heart Tank through the first time, you can get it even easier. Equip the Boomerang Cutter, stand in the position shown in the picture, and shoot one boomerang. It will grab the heart tank and bring it to you... easy as that! Amazingly, it is even possible to dash jump off the wall below the balcony and make it up to the Heart Tank. It is similar to the jump to Spark Mandrill's Heart Tank, only much, much harder. It is known to the speedrunning community as the legendary 'iceless' jump. Before going down into the tunnel, jump into the pit right before it (sounds scary but don't worry) and destroy the blocks with your Leg Upgrade. 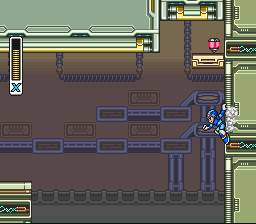 Stand at the edge of the small platform and perform a dash jump, which will cause you to land on the platform that's on the other side; pick up the Heart Tank and go back the same way you came. Make sure to have beaten Launch Octopus's stage, or else there won't be any water in the pit. Alternatively, there is a way to get the Heart Tank without the water. A charged Shotgun Ice also works but it is very tricky and risky to do, requiring you to do a specific jump for the right pit. ...then destroy the blocks and stand in the position shown. 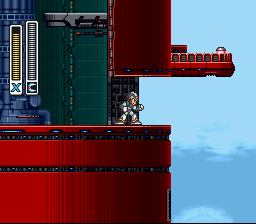 When you get to the very top of the moving platforms in the beginning, dash jump to the left from the moving platform you're currently on; if you jump far enough, you should land on a roof where a Heart Tank lies. To continue with the stage, jump down and go on the moving platforms again, but this time, jump to the right instead of the left once you reach the top. This page was last edited on 11 December 2016, at 03:00. This page has been accessed 387,295 times.